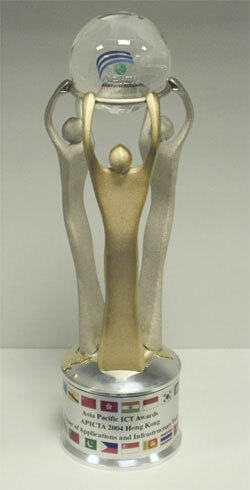 Visual Paradigm Wins Asia Pacific ICT Awards 2004! Visual Paradigm for UML was awarded the Asia Pacific ICT Awards (APICTA) - Winner of Applications and Infrastructure category (within 14 categories) of the Year 2004, among 146 nominees from 14 countries. APICTA - This Award is presented to the most innovative nomination for the development of applications and infrastructure tools. Any software program that operates hardware, increases efficiency of systems, measures/monitors systems usage and performance, provides data access/retrieval, data manipulation (e.g. sort/merge), data management, data warehousing and program design/development. Visual Paradigm for the Unified Modeling Language (VP-UML) is a UML CASE tool. The tool is designed for a wide range of users, including Software Engineers, System Analysts, Business Analysts, System Architects alike, who are interested in building large scale software systems reliably through the use of the Object-Oriented approach. VP-UML supports the latest standards of Java and UML notations and provides the industry's full round-trip code generation and code reverse engineering support for Java. In addition, VP-UML is integrated with Eclipse/IBM WebSphere®, Borland® JBuilder®, NetBeans IDE/Sun™ONE, IntelliJ IDEA™, Oracle JDeveloper and BEA WebLogic Workshop™ to support the implementation phase of software development. The transitions from analysis to design and then to implementation are seamlessly integrated within the CASE tool, thus significantly reducing efforts in all stages of the software development life cycle.